For those who might not know of James Beard, he was a larger-than-life force of nature. Named the “Dean of American Cookery” by the New York Times in 1954, he was a chef and gourmand who laid the groundwork for much of the cuisine American chefs create today, as well as for the way that we eat. In 1955, Beard established the James Beard Cooking School, where he would teach would-be chefs cooking skills and techniques for the next 30 years. 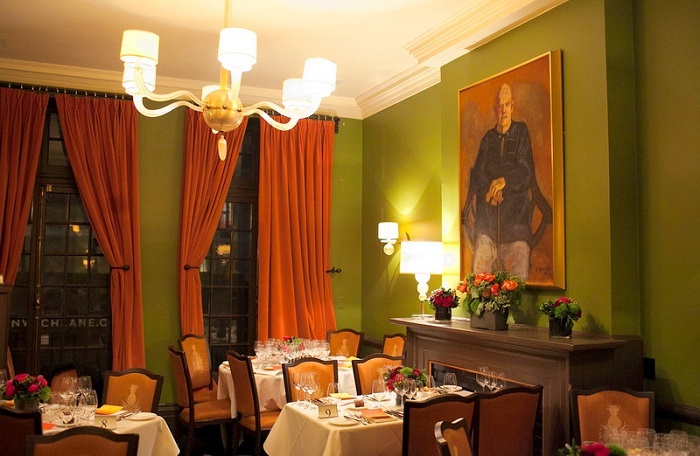 Following his death in 1985, the James Beard Foundation was created in New York City, and today maintains the historic James Beard House in Greenwich Village, where Beard lived. 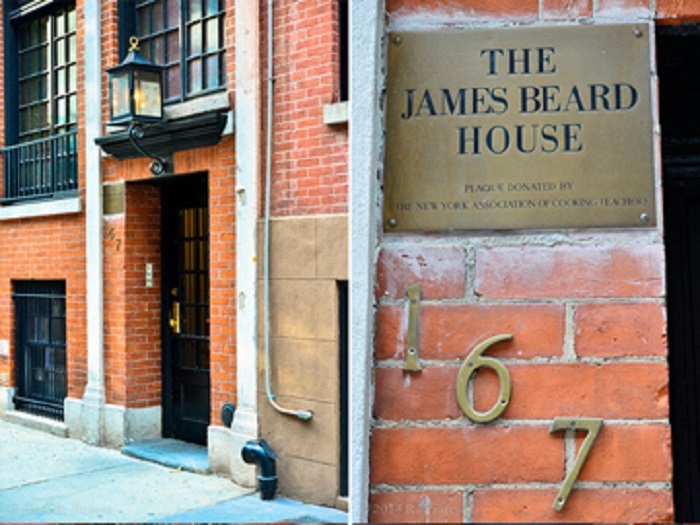 A funny story about the James Beard House … When I was a graduate student in NYC in the 80s, my girlfriend’s brownstone house in Greenwich Village looked out on the courtyard of James Beard’s house. Well, Beard was known as being very fond of his outdoor showers and, as close neighbors, we – if unintentionally – were privy to viewing a few of those showers. Anyway, the James Beard House hosts chefs to cook there, from NYC and beyond, who are invited by the director of house programming. 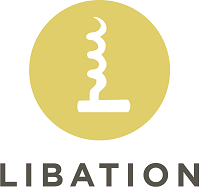 The selection process is very thorough and requires a detailed proposal which includes complete menu details and beverage pairings. Next Thursday, September 20th, five of Park City’s most celebrated chefs will present their craft in NYC at the James Beard House. The chefs selected are Jodie Rogers, Deer Valley Resort’s Director of Food and Beverage; Briar Handly, Chef/Partner of Handle; Seth Adams, Executive Chef and Owner of Riverhorse on Main; Zane Holmquist, Vice President of Food & Beverage and Corporate Chef for The Stein Collection; and Matthew Harris, Chef/Owner of Tupelo restaurant. This is a very dynamic team that has already done something no one else has: They sold out the James Beard Dinner within a week of the tickets going on sale. 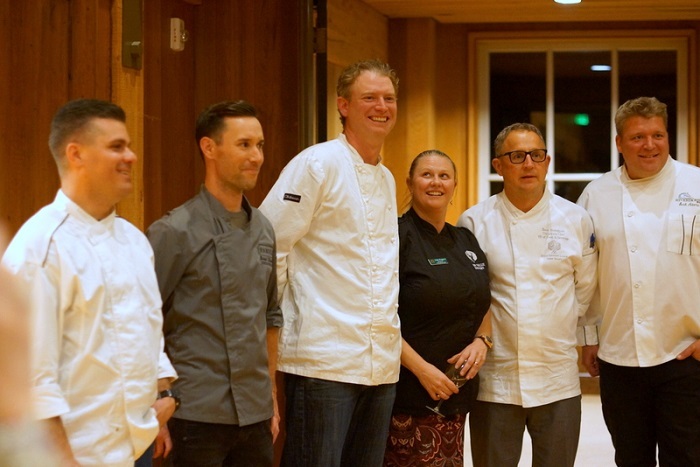 Last week, I was privileged to attend a Park City preview (and practice) of the NYC James Beard Dinner, host by Deer Valley Resort and the Park City Area Restaurant Association at Deer Valley’s Snow Park Lodge. Everything – all of the dishes and beverages served, and even the table layouts – mirrored what the five Park City chefs will present at the James Beard House. All I can say is, the folks attending the dinner in NYC are in for a treat! The evening began on the Snow Park Lodge deck (sad that the New Yorkers won’t have the exquisite mountain views provided by Deer Valley Resort!) with passed hor d’oeuvres prepared by Matt Harris of Tupelo. The “Utah-centric” finger foods included compressed Green River melon, Tupelo Farms sunburst tomatoes, and hop-smoked Utah trout, paired with two signature cocktails from Park City’s own High West Distillery. Those cocktails will also be served in NYC and were the Little Hollywood, High West’s Double Rye with guava juice, earl grey syrup, tarragon leaves, lime juice and tarragon, and the Distillery’s Old Fashioned of Rendezvous Rye, demerara sugar and angostura bitters with a citrus twist. After an hour or so of schmoozing on the deck in the fresh mountain air, we were ushered into the Snow Park Lodge for a five-course dinner that rocked the Lodge. Here is a breakdown of the dishes and drink pairings. 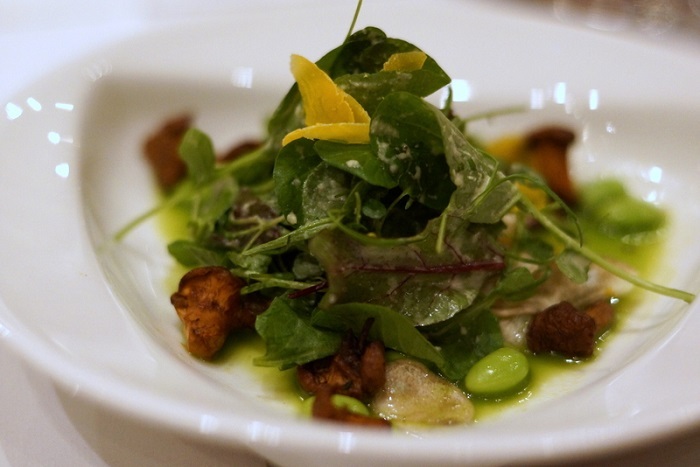 The first course presented was the creation of Jodie Rogers and her uber-talented Deer Valley Resort staff: “Soup & Salad.” This wasn’t just any “soup and salad,” however. It was a delicious fresh pea and watercress salad with crispy mushroom morsels, paired with a beautiful wine: Chateau Gassier Espirit Gassier Côtes de Provence Rosé 2017. It was the perfect kick-off for the evening’s meal. For me, the most visually stunning dish of the evening was Briar Handly’s. 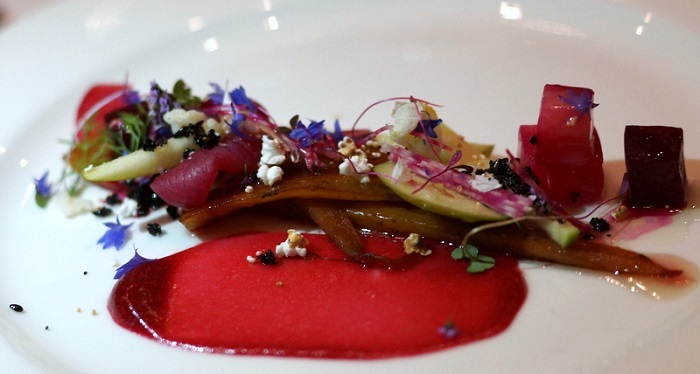 He contributed an eye-popping plate of smoked parsnip with Granny Smith apple, beetroot, puffed rice, edible flowers, onions, candied seeds and more, all paired with an outstanding California wine: Trinafour Semillon 2017, which is made from the oldest Semillon vines in the country. And yes, Handly’s creation tasted every bit as wonderful as it looked. Zane Holmquist is no stranger to cooking in NYC, having made numerous holiday season appearances to cook on the Today morning television show. 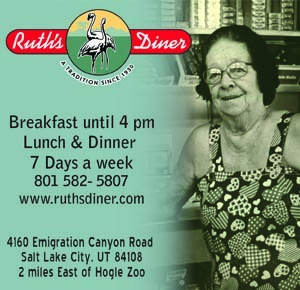 At the Park City event, his was one of my favorite dishes, particularly because I love rabbit but find it so rarely on Utah restaurant menus. Zane created a rabbit porchetta dish: cider-braised rabbit leg stuffed with with foie gras, and served with carrots and mushrooms and apple mostarda, creatively paired with Mountain West Ruby Cider. Next up was a hearty, heavenly dish from Seth Adams of the Riverhorse. 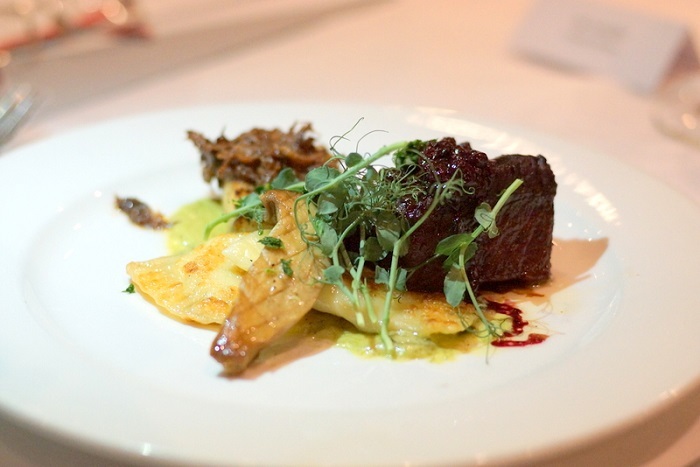 He offered a melt-in-the-mouth 44 Farms Wagyu beef short rib with King Trumpet mushrooms on the side, huckleberries, oxtail toast, and handmade ricotta pierogies. Paired with Parallel Napa Valley Cabernet Sauvignon 2014, this dish was a slam-dunk. Loved it! Along with the yummy canapés that kicked the James Beard evening off, Matt Harris also provided dessert for the crowd of 80 or so diners. Now, I’m not typically much of a dessert fan. I’m usually too full by the time dessert rolls around to appreciate it. And yes, I was pretty stuffed already when Matt’s dessert hit our table. But, it was stunning. And, really satisfying. Harris was wise enough to realize that by the night’s fifth course, diners like me weren’t going to want a heavy, cloying dessert. 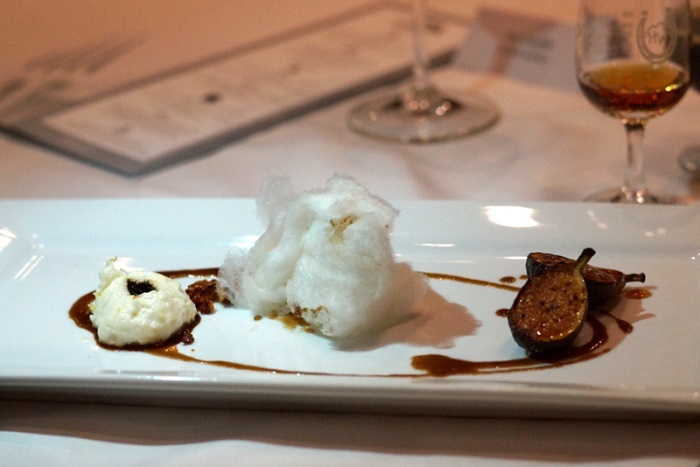 So, he opted for a fairly light treatment of chargrilled figs with silky goat’s milk ricotta, honeycomb and puffed honey-spiked cotton candy, paired with Red Rock Brewing Furlong Bourbon Barrel-Aged Imperial Stout. Again, a very creative pairing. How often to you drink Stout with dessert? I would suggest that if you happen to be in New York City next week, that you should try to drop in on the Park City chefs’ James Beard Dinner. But, as I mentioned, the dinner has been sold out for quite some time. 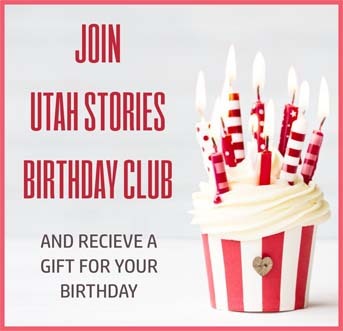 Those lucky New Yorkers are going to get a delicious dose of Utah. You can, however, indulge in these five brilliant chefs’ culinary creations in their own restaurant, right here in Park City, Utah, and you should.